During my high school and college years, I was exposed to a lot of great music. But as I've gotten older, I tend to follow fewer bands. 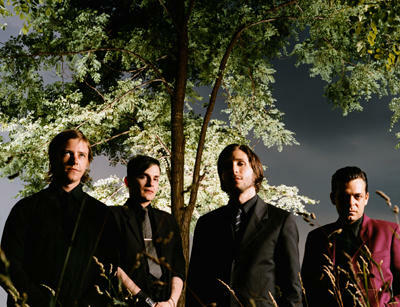 Interpol is one of the few current acts that I do keep track of. I rarely go to concerts these days because of money reasons. But if the moolah flowed more freely, I'd treat my ears to an Interpol show. I hear their drums and bass sound great live, and their rhythm section is one of my favorite aspects of the band. Interpol also wrote one of the few albums that I still enjoy listening to from beginning to end, a feat that seems rare in the iPod shuffle age. The album is called "Antics", and it helped the band avoid the dreaded sophomore slump. "Antics" was the second of three full-length albums, and is clearly their best recording as a whole. But I still like the other two. On their site, www.interpolnyc.com (yes, they're New Yorkers too), they recently announced that they were writing a fourth album. I'm psyched. It sounded like the early rehearsals of the new material have been going really well. Even though my wife isn't a fan, she's actually gotten closer to the band than I have. She's seen Paul Banks, the lead singer, quite a few times. My wife works part-time at a private school in New York City, and it turns out that Banks' girlfriend's kid goes to the same school. Sometimes Banks picks up the kid after school. Once, he came to watch the kid play in a music jam session class. If only Banks sang and played guitar with them. I would've played hooky to see that.